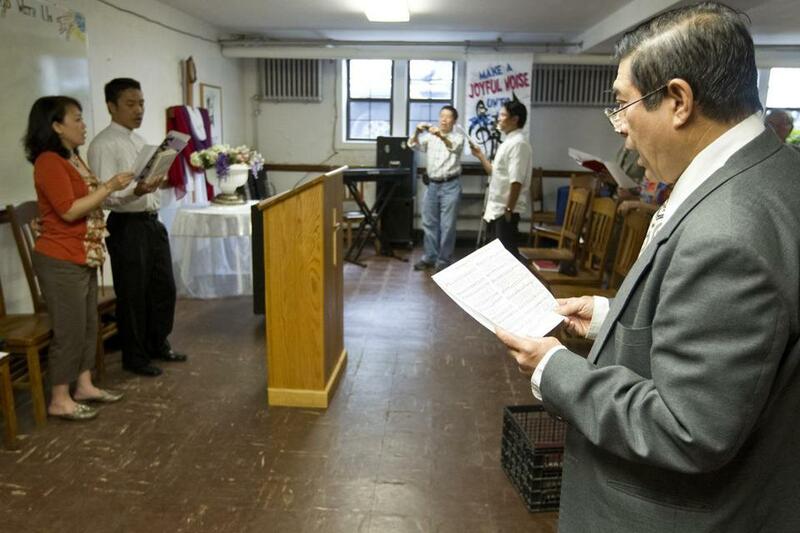 Henry Soe sang a hymn at the Overseas Burmese Christian Fellowship in the International Community Church in Allston. He is optimistic about Myanmar’s future in the new year. The water Sai Kyaw splashed on his children’s necks and shoulders was meant to cleanse them and mark a fresh start to the Burmese New Year. Like many Burmese in the Boston area, Kyaw and his family followed their centuries-old tradition this weekend by dousing each other with water and serving traditional coconut-crusted rice balls in the restaurant they own in Allston. The Burmese New Year, called Thingyan, lasts three days and concluded Sunday. As Kyaw dabbed his 5-year-old son, Henry, with a sprig of dampened yellow heather, he said this year - 1373 on the Burmese calendar - was infused with extra jubilation. Thawdar Kyaw celebrated the new year by sprinkling water on Jean Rossner (center) and Patricia Huff at YoMa restaurant. As the new calendar begins, Kyaw hoped that Myanmar, formerly known as Burma, could begin anew, washed of its politically oppressed past. Two weeks ago, he popped a bottle of champagne with friends to commemorate the historic election of Nobel Peace Prize laureate Aung San Suu Kyi to a seat in Myanmar’s parliament. The iconic democracy advocate, who spent 15 years under house arrest and was released in 2010, is considered an international symbol of freedom. As the country’s restrictive military rulers inch toward democracy, Kyaw said this year, more than two decades after he fled as a political refugee, he will visit his homeland. “Before, I was nervous, but now the government is more open,’’ Kyaw, 48, said Saturday as his mostly Burmese customers celebrated the holiday with a traditional lunch in his restaurant. Like its country of origin, the fete is known by two names in English. Many Burmese also refer to the new year as the Water Festival, referring to revelers’ tradition of drenching each other. For Kyaw’s two children - who played in the back of YoMa, the North Beacon Street restaurant, this weekend - the waterworks became a game. By “other people,’’ she mostly meant her brother, Henry, who quickly pulled his iPhone to dry safety on his lap. At the Burmese Christian Fellowship one block away from the restaurant, more than a dozen worshipers gathered Sunday afternoon for their usual church service. Though the parishioners observed some New Year traditions at home, the pastor said they would celebrate the holiday this summer when warm weather is suitable for the wet revelry. “Normally we wait until June or July and do a water festival,’’ said the Rev. Zaw Wynn Tan, 44. Tan said he hoped the New Year would usher in more democratic change in Myanmar, but he remained wary of the military regime. But Henry Soe, 67, a churchgoer who grinned proudly at the fact that he was born he same year as Aung San Suu Kyi, was optimistic about Myanmar’s future. As investors begin eyeing the long-impoverished country and once icy diplomatic relations with the West thaw, Tan said he believes this year will be one of significant, if slow, change. Alexander C. Kaufman can be reached at akaufman@globe.com. Follow him on Twitter @AlexCKaufman.